Last edited: February 24, 2018 . Please read our disclaimer. Figure 1. Tympanostomy tube (T-tube) -- the small blue piece -- being placed in a retracted ear drum (anterior superior is best location -- see below). Figure 2. 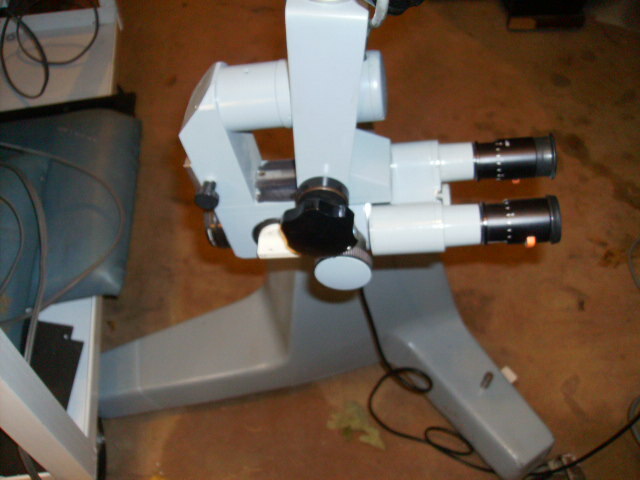 Typical otomicroscope used to place tubes into ear drum. Tympanostomy tubes, or "tubes, are a method of creating a perforation in the tympanic membrane (ear drum). 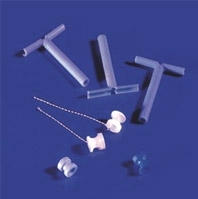 Although the technique of myringotomy (putting a hole in the ear drum to improve hearing) dates back to the 1700's, placing a tube in the ear drum (figure 1) to ventilate the middle ear space began in 1954. This may be due to the general availability of otomiscrosopes (figure 2) which allow physicians to see the ear drum under high magnification while working. Tympanostomy tube insertion is now one of the most frequently performed procedures in otolaryngology. There are presently a large number of variant tubes (see above). Most are commercial products but some doctors manufacture their own out of plastic tubing. The tubes mainly vary in size and tenacity with which they remain in the ear drum. Myringotomies usually close in a few weeks but tubes may remain in place for months to as long as one-two years. The main purpose of ventilation tubes is to ventilate the middle ear, usually in an attempt to control an infection or drain fluid. Tubes may also be inserted to deliver pressure (the Menniett device for Meniere's disease), medication, relieve pain, administer medications, or simply to substitute for a faulty eustachian tube. In our practice in Chicago, we also sometimes recommend tubes for perilymph fistula. 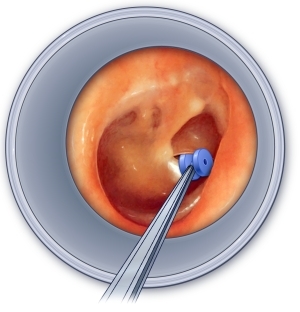 When a myringotomy is performed, the ear is washed, anesthesia is applied, a small incision made in the eardrum, the fluid sucked out, a tube inserted, and the ear packed with cotton to control bleeding. If local anesthesia is used, a cream containing lidocaine and prilocaine is applied to the ear canal about 30 minutes before the myringotomy (e.g. EMLA cream). Other methods can be used for anesthesia too. 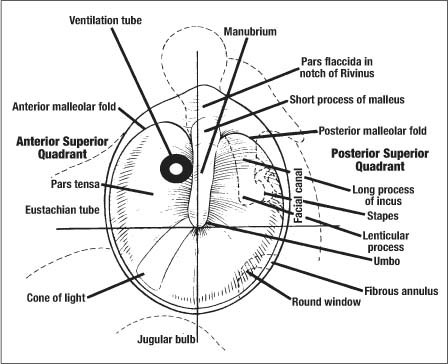 According to Paparella (2009), tubes should ideally be inserted into the anterior superior quadrant, adjacent to the malleus, and halfway between the umbo and short process of the malleus. A tube should not be inserted into the posterior superior quadrant because of important middle ear structures located in that region (i.e. ossicles). Likewise, placement into the posterior inferior quadrant could potentially damage the round window or potentially be complicated by a dehiscent jugular bulb. There are many variants of tubes -- the choice of which depends on clinical judgement. Tubes often fall out (extrude), with this happening more quickly for smaller tubes than larger ones. Tubes with lumens (openings) of about 1.1 mm will last about a year before spontaneously extruding. Tubes of 1.5 mm size typically stay in place for years. Tubes intended to remain for long periods of time often have flanges or are arranged in a "T" so that they are less likely to come out (extrude). Another design is called a "grommet". Inward movement of tube into middle ear (called retraction). Complications, such as otorrhea, tympanosclerosis, and cholesteatoma, have been reported in the literature after its application. In a study by Kalcioglu and others (2003), otorrhea developed in 3 (0.8%) cases. Tympanosclerosis was seen in 74 (20.2%) cases. Tympanic membrane perforation, retraction pocket, granulation tissue, and atelectasis were seen in 4.6%, 5.2%, 1.1%, and 6%, respectively. Hearing results were improved postoperatively in 93.4% of patients (median, 14.2 dB) and worse in 6.6% of patients (median, 8.3 dB). The average extrusion time was 7.3 months for grommet and 16.3 months for T-tubes. Tubes may become blocked. This can usually be determined by the patient in that when they blow their nose, no air escapes through the tube and this alerts them that the tube may be blocked. In the author's practice, these situations are handled by cleaning the ear using a microscope, and sometimes by providing the patient with a thin antibiotic ear drop. There is some physician and patient concern about allowing water such as might be introduced during bathing or swimming into an ear with a tube. Several large meta-analysis type studies have shown no increase in ear drainage in patients who are exposed to water (Lee et al, 1999; Carbonell et al, 2002). Tubes are foreign bodies of course, being made of plastic or metal, and they provide a conduit for water, bacteria, viruses and fungi into the middle ear. Thus, although tubes are often intended to treat infections, they can also lead to infections as well. When this happens, the ear is usually treated with ear drops, in a similar way as external otitis. The ear tube may move inward and get trapped in the middle ear, rather than move out into the external ear, where it either falls out on its own or can be retrieved by a doctor. The exact incidence of tubes moving inward is not known. It probably is rare in as much as tube insertion is very common. In theory, it could increase the risk of further middle-ear inflammation, formation of a mass in the middle ear, or infection due to the presence of a foreign body. It would also seem likely that the tube would naturally migrate out of the middle ear into the eustachian tube and into the throat. Tubes are not at all a contraindication to flying. In fact, flying with a tube is safer in some ways as it provides a pressure relief for the ear drum. Water caloric tests -- an important part of the ENG (not done because of danger of infection). Water calorics are the better way to do calorics (compared to ear or closed loop). VEMP (difficult to interpret due to conductive hearing loss associated with tubes). Because of these considerations, one should schedule ones tubes or other procedures AFTER diagnostic testing is complete. Tympanostomy tubes in children are generally felt indicated in recurrent otitis media, failed multiple courses of antibodies, and persistent otitis media with effusion. Other indications are persistent retraction with discomfort, erosion of the ossicles, manifest or impending complications such as facial paralysis, labyrinthitis, or mastoiditis. Delay in initiation of speech, allergy, seasonality are all variables to consider. Tube placement is associated with a slight and slow gradual improvement in balance in children (Cohen et al, 2011). Allergy treatments and decongestants generally are not helpful in treating persistent otitis media with effusion. Antimicrobials and steroids may work but lack long-term efficacy. In the posterior-superior quadrant of the ear drum, look to see if the eardrum touches the incus. If it does, this is a risk of erosion and development of a conductive hearing loss in childhood. Costs of placing ear tubes. Sjogren et al (2015) reported costs of inserting tubes in children, including 5623 pediatric tubes placed by 67 surgeons. The authors were based in Salt Lake City, Utah, and presumably thee data are taken from that location. The mean cost of surgery was $769 ranging from $509-$1212. The main cost of the procedure was hospital costs such as operating room (OR), as well same day surgery, anesthesia, pharmacy and OR supplies. They commented that OR and same-day surgery preoperative costs accounted for the greatest expenditure in tube placement. Logically, placement of tubes in cooperative adult outpatients, which can be done using local anesthesia in the clinic, should be less costly. Of course, one would also expect costs to vary according to location in the world, and comparing urban to rural environments. Harris and associates (2017) reviewed 10 websites concerning tympanostomy tubes. They commented in their "results section", that "Ten most frequently encountered websites were analyzed. One of 10 met national health literacy standards. All sites were understandable... Most had low actionability scores (7 of 10, median 47%, mean 44.6%, range 0-80). Shared decision-making centrality was high (mean 5, range 4-6), but most did not list alternative treatment options. Although CPG [Clinical Practice Guideline] compatibility was high (mean 3.4, range 1-4), many websites contained inconsistent recommendations about tube duration, follow-up, and water precautions. ". We will keep these author's comments in mind as we add more material in the future. Carbonell, R. and V. Ruiz-Garcia (2002). "Ventilation tubes after surgery for otitis media with effusion or acute otitis media and swimming. Systematic review and meta-analysis." Int J Pediatr Otorhinolaryngol 66(3): 281-9. Daly KA, Hunter LL, Lindgren BR, Margolis R, Giebink GS.Chronic otitis media with effusion sequelae in children treated with tubes. Arch Otolaryngol Head Neck Surg 2003 May;129(5):517-22 . Lee, D., A. Youk, et al. (1999). "A meta-analysis of swimming and water precautions." Laryngoscope 109(4): 536-40. KALCIOGLU MT, Cokkeser Y, Kizilay A, Ozturan O. Follow-up of 366 ears after tympanostomy tube insertion: Why is it draining? Otolaryngol Head Neck Surg 2003; 128: 560-4..
Sjogren PP, Gale C, Henrichsen J, Olsen G, Ott MJ, Peters M, Srivastava R, Meier JD.Variation in costs among surgeons and hospitals in Pediatric tympanostomy tube placement. Laryngoscope. 2015 Nov 24. doi: 10.1002/lary.25775.